Gollup's turning to Kickstarter to get this thing funded. Back in the mists of time Julian Gollop, better known as the wizard behind the original XCom, designed a Spectrum strategy title: Chaos: The Battle of Wizards. Now the time has come to revisit those days of yore, and Gollop intends to take his new Chaos Reborn to Kickstarter. The idea is to get this done and out in the market within a year, on PC, Mac and Linux. Right now, it's just in the Prefundia stage. 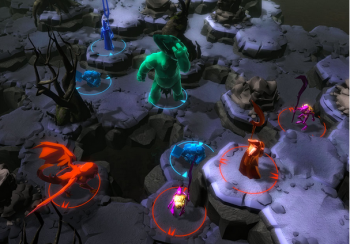 Chaos Reborn will be a turn based strategy with RPG elements, and will feature single as well as multiplayer options. You take your wizard into the arena, blasting down the foe with mighty spells and summoned creatures, collecting sweet loot along the way. The truly successful become Wizard Lords, but that's just one step along the path which might see you become a God of Chaos. Gollop's been working on this one for a while, and has a functional multiplayer online prototype. It's just placeholder graphics for now; the real stuff will be put together after Gollop gets some cash in his pocket. Here's hoping this one gets all the Kickstarter love it deserves!